The Profoto 8a Air (2400Ws) delivers only 1000 full power flashes an hour? Yup. That's 16.67 flashes per minute. So even though it recycles at 0.9 seconds, it can't be abused consistently at 60 full power flashes per minute. At 16.67 flashes per minute you're averaging 3.6 second delays. Why? Because each pack (and head) has a maximum continuous usage. The Profoto 8a has a maximum continuous usage of 40,000Ws per minute. So what's the Zeus Z2500 (2500Ws) maximum continuous usage rating? The Z2500 pack (and head) has a limit of 30,000Ws per minute. That's 12 full dumps per minute (remember it's full power is 2,500WS and not 2,400Ws) so about 33% less maximum continuous usage "capacity". I'm guessing beyond 12 full dumps per minute and you trip the built-in breaker on the Z2500. Same goes for the Profoto 8a but you get almost 17 full dumps. See my previous post for spec comparisons including price. Let's just say there's about $10k+ in price difference. It was just a matter of time before I wanted more power. The White Lightning X3200 has been great but the recycle time and flash duration has left me wanting... well more. 1. Shorter recycle times means faster shutters and more frames. I'm trigger happy. Especially these days that I'm shooting more with the D3, I like taking lots of frames. 2. Faster flash durations means a) freezing action but more importantly b) it means I get to sync faster. With the Hasselblad, I can sync 1/800th. But with slow flash duration it means I can't get all those Watt-seconds into my window of opportunity. Faster shutter speeds also means better control of ambient light. 3. More power means better control of ambient light. It means having the ability to overpower the sun and restructure the light on my subject the way I want it. Also the Hasselblad operates at a baseline of ISO100. Even with the X3200 at full power I'm only sometimes getting f/7.1 depending on what modifier and working distance I'm using. F--- YOU Gradient Map Opacity Stop!!! Rather than retype my entire post, I'm going to link you to my post directly over at the Adobe forums. Click here to make the jump. If anyone can resolve this issue for me, you will in effect resolve one of my longest-standing problems with Photoshop. Here's the follow-up to this post. 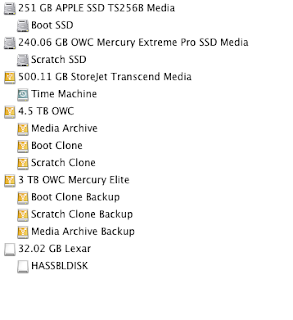 The Boot Clone and Scratch Clone are of course clones of my Boot SSD and my Scratch SSD. Just in case I lose my computer or it blows up, I'll be able to be up and running shortly with minimal loss since I have clones of my internal disks. I also have a Time Machine unit backing up my Boot and Scratch drives for, "Oops I didn't mean to delete that file and then empty the Trash" situations. I have a confession. I can not tell you if a model is photogenic until after I see her images on either camera-back or on-screen. In fact, I think I'm more confused than ever. There are times when I meet a model and she is strikingly beautiful but yet falls flat in the images. Then there are days when I'm not impressed by the model's looks as she walks through the door but when I see the images, I'm floored. Yes, I know this is normal. But as it happens more and more often to me, I feel totally caught off guard. You'd think that after all this time I'd develop some vision for how they'd photograph. But no. I wrote this post back in 2009 and I think it's time to revisit this issue again. Perhaps the greatest benefit of higher level education is that you learn how to learn. We touched on this topic several times in my Psychology program in graduate school. It still fascinates me to this day. But I'm not here to talk about theory. I'm here to talk about practice. It occurred to me the other day that comparing histograms from images that you find online may not give you the "whole picture". This is because web images are usually sRGB and most of the time I'm starting at a ProPhoto RGB. Converting one to another changes the histogram substantially. I discovered today that an ex-coworker of mine is leaving my former company to pursue her dreams on Broadway in New York. That really triggered something in me, a feeling of something new, exciting, and hopeful. Now you all know me by now to be a square. That's because I am a square. I tell it like it is. I don't believe in deluding yourself for mental masturbatory purposes. I believe that being honest to yourself saves yourself a lot of grief that comes with false expectations. I am thinking about shooting a fashion story for magazine submission. It's a contest, but if I lose then I can still submit to other publications. Is it common for the agencies to let models do these sort of shoots or should I go through an agency at all? Also, it is my understanding that agency models are generally not allowed to sign a release. So, if that is the case, what hoops need to be jumped through? First off, I haven't had a model sign a model release in a longgg time, well over a year now. I am betting that the model release is something that was recently invented. I can't imagine Demarchelier or Avedon ever asking their models to sign releases even before they were famous. I'm always trying to maximize my measly little 8GB i7 MBP. I read blogs like macperformanceguide.com and do research on Photoshop etc. When it came to cache tile size, I figured that my 31MP files were considered large. 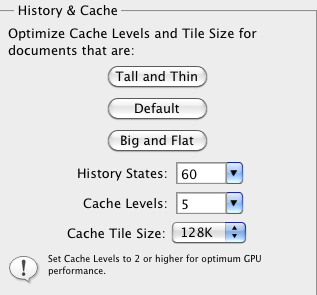 I took the advice of Lloyd and at least one other website to max out the cache tile size.